Positive psychology is currently equated with theory and research on the positive aspects of life. The reality could not be further from the truth. Positive psychology investigates and researches some of the most difficult and painful experiences. 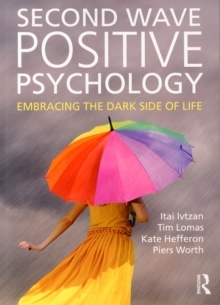 Second Wave Positive Psychology: Embracing the Dark Side of Life is an innovative and groundbreaking textbook that explores a variety of topics we consider to be part of the `dark' side of life while emphasising their role in our positive functioning and transformation as human beings. This more nuanced approach to the notions of `positive' and `negative' can be described as the `second wave' of Positive Psychology. Positive Psychology is one of the fastest growing and least understood branches of psychology. Exploring topics at the heart of Positive Psychology, such as meaning, resilience, human development, mortality, change, suffering, and spirituality, this book engages with so-called `negative' matters from a Positive Psychology angle, showing how the path of personal development can involve experiences which, while challenging, can lead to growth, insight, healing and transformation. Containing useful resources, case studies, practical exercises and chapter summaries, Second Wave Positive Psychology is an essential guide for undergraduate and postgraduate students studying positive psychology, as well as clinicians wanting to know more about the subject. It will also be relevant to the layperson who is interested in positive psychology.